There are a handful of books on my 100 books challenge that I read in my youth. I felt that, by re-reading them through the eyes of my adulthood, I might view them in a different light. One of these books is Jack London’s 1903 young adult novel The Call of the Wild. At the center of the story is the dog, Buck. While living in the home of a judge’s family in California, Buck is abducted and transported to the Canada-Alaska border, where he is destined to serve as a sled-dog in the Klondike gold rush. Along the way, he comes into the hands of several masters — some benevolent, others not so much. I think I first read this book around the age of 10, and the only thing I remembered was that it was the story of a dog. As an adult, I noticed the quest for riches at any cost as being one of the over-arching themes of the book. Interestingly the only version available at my local library was the one illustrated by Philippe Munch, so in addition to reading the story, I also learned lots of tidbits about the history of the gold rush and the fauna of Alaska. I do think this is a good read for children, even as young as elementary school age when read with a parent. It is not a sugar-coated story about a dog by any means, and deals with difficult topics such as animal abuse and death. At the core of the story is the natural world, the true instincts of animals in the quest to survive, and the battle between and amongst species. As an adult interested in the life and writing of Jack London, I am now curious to read John Barleycorn, which is one of London’s few novels written for adults. It is supposedly highly autobiographical, and deals with London’s struggle with alcoholism, which likely contributed to his early death at the age of 40. 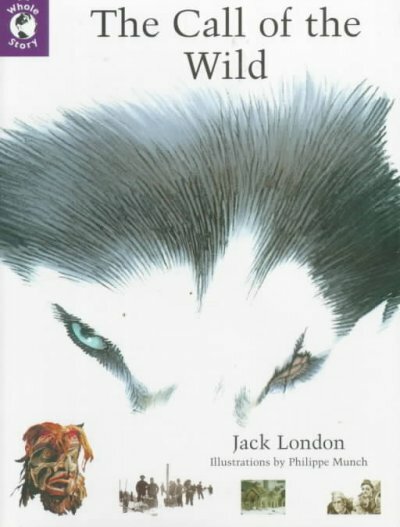 This entry was posted in Book Challenge and tagged book reviews, children's literature, Jack London, young adult fiction. Bookmark the permalink. It’s so interesting to hear how our understanding of books changes as we grow older. I’ve re-read several books from my childhood, and may add Call of the Wild to my list now that I’ve seen your thoughts on it. Great post! Thanks! It’s a fairly quick read if you do decide to give it a try. The illustrated version is just over 100 pages.